I just posted on Friday. And today is Sunday. And I'm blogging again. Yay! Anywho, in the great book I just read, it talked about reading great literature. Some of the last pages of said book contain a list of one hundred books that a man should read. So I got the idea that I should start a book club for men only. It was only in recent decades that book clubs became associated* with feeling sharing time and weep fests. Just read one book a month (because of school/work schedules sometimes bog us down). Discuss the principles and lessons learned from the book. Discuss how we can apply those principles and lessons to become better individuals. I'm pretty sure that the vast audience of my blog readers are female, but don't you think that this is a really good idea? I love reading, but it has been a long time since I have sat down and read a good novel. Once this get's rolling I'll have an excuse to expand my appreciation of great literary works. English majors aren't invited. Sorry. And now the random photo from the mission! 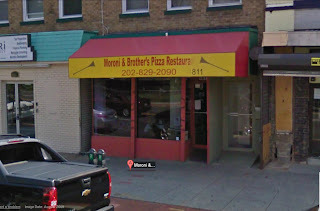 Lunch at Moroni & Brother's Pizza (which is owned by a member in the Spanish branch) with my Mexican Elders.... They're not really Mexican, but they're in the Spanish program. Love these Elders! 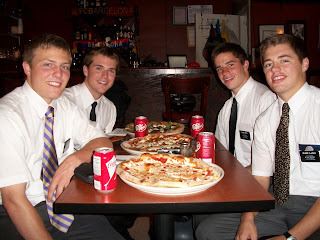 LtoR: Elder Jordan L, Elder Me, Elder Ty W, Elder Bret C. Yummy yummy pizza! The exterior of the restaurant, courtesy of Google maps. *I know that there are many book clubs that aren't full of feeling sharing time or weep fests. Society, however, ofttimes views them as such. Woo hoo! I've got the first comment, Gertrude!. Lame... MOMMA LIEBHARDT IS A CHEATER!!! Excellant Club idea, Eric. I was especially pleased by the"English majors aren't invited. Sorry." comment. SO necessary. I would like to be the Archduke of this club. This is going to make us SO manly!!!!! !